Going up. Looking up. World Trade Centre. 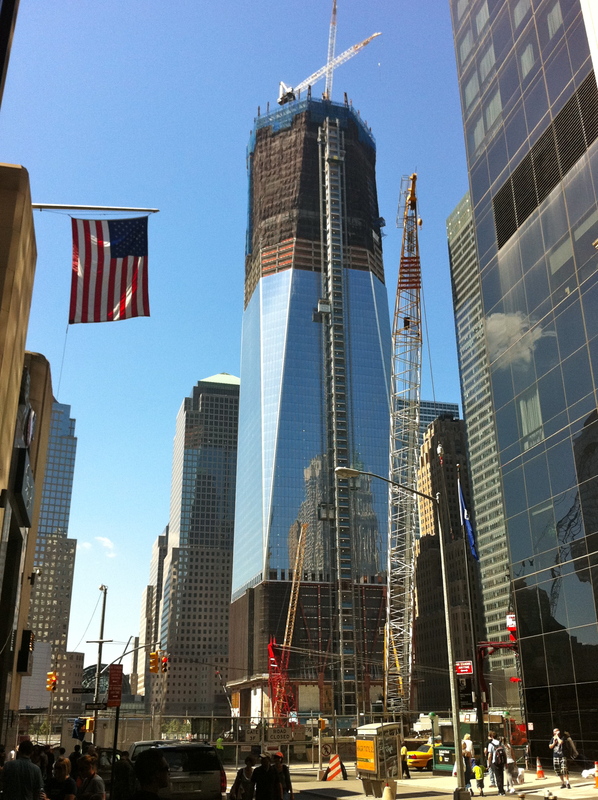 Rebuilding of Ground Zero. New York City. Photo taken in the afternoon of 30 August, 2011. iPhone.
. . . that we should ever forget. Well this is certainly up – going up. I like the photo too. Especially the images reflecting in the windows of the buildings. Thanks UBG! I know I haven’t been down in that part of town for ages but it was such a surprise to see the progress. We just watched a two hour special on the construction and engineering at the site. A fabulous building and a remarkable photo. You inspire me. I will have to look out for that documentary – I was surprised at how spectacular the buildings look at this stage of the construction. You will have to come to NY to see them for yourself! Very inspiring! I didn’t know that they were that far along on the rebuilding. Thank you for posting this photo. My pleasure Theresa! With so many mixed emotions fixed to the site it was surprising to be confronted with these towers of beaming light and reflection. Glad you enjoyed, thank you! From the sad , heartbreaking event of 9/11 comes a rebirth that will rise up all hopes and dreams. This pic simply makes me happy that slowly we’re rebuilding a legacy. A phoenix rising from the ashes . . . Surprisingly good and really far more exciting than I would have thought – it will be a lovely part of town when finished. a great interpretation of ‘up’! love the angle – this image really draws your eyes up….. thanks for sharing. Yes, the building does grab the eyes and take them up when for so long the site was empty, tragic space. Thanks for enjoying and I look fwd to exploring your link! I wonder if I could get to NY in time for the opening, when it happens. Your photo makes it look quite spectacular, even at this construction stage – and with an iPhone. I’m definitely going to get one now! Save the date and come on over! You will love it, NYC, and I can’t tell you how much I love my iPhone. It was such a breath taking sight and I just wanted to grab it, the iPhone was all I had. . .
SIG, I can’t tell you the shock I felt at coming across the sudden progress at this site. Thank you so much for your lovely comment!